WINONA, MINN., USA — PlastiComp boosts properties of high-temperature polymers such as PPS, PES, PEI and PEEK, with proprietary long fiber technology. PlastiComp, Inc. announced the successful application of its long fiber thermoplastic (LFT) technology to high temperature polymers such as PPS, PES, PEI, and PEEK reinforced with carbon fibers. These new composite materials have potential for further penetration into traditional metal applications requiring very high modulus. According to laboratory testing, high-temperature polymers achieve higher performance with the PlastiComp LFT process. 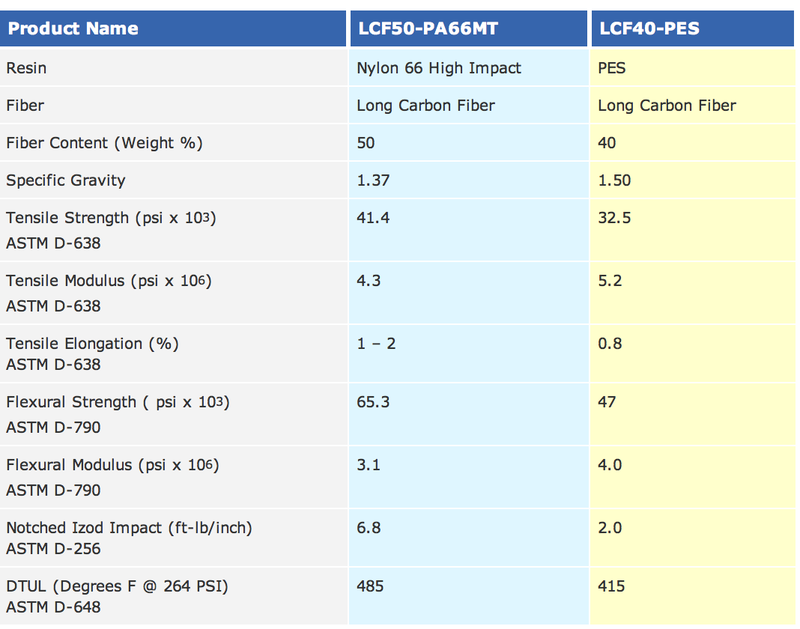 The table on page 2 demonstrates the favorable properties of Long Carbon-Fiber reinforced PES and high-impact Nylon 6,6 from PlastiComp. PlastiComp’s new high-performance materials are targeted for metal replacement in military, industrial, and aerospace applications. In addition to light-weighting, the materials can also be customized for EMI shielding and thermal properties. Values included in this Property Data Sheet are based on limited laboratory test specimens. These values are typical values and are not meant to be used for setting maximum or minimum values for specification purposes. Any determination of the suitability of the materials shown in this property data sheet for use by the end user is the sole responsibility of the user, who must assure himself that the material as subsequently processed meets the need of his particular product or use. To the best of our knowledge the information in this publication is accurate and reliable, PlastiComp does not assume any liability whatsoever for the accuracy of this information.